A human rights worker and an activist accused of violence against security forces appeared in court on Wednesday despite international pressure for the cases to be dropped. Am Sam Ath, monitoring manager at local rights group Licadho, and Boeung Kak Lake activist Chan Puthisak, were handed the charges for allegedly attacking district security guards at a demonstration in October last year. Sam Ath was badly beaten during the World Habitat day protest. Both men have denied the charges and say they were the subject of an unprovoked attack by the same security force that is the plaintiff in the case against them. “I said that I didn’t commit anything as accused by these people [security guards] and I also didn’t know their faces. I clarified that I didn’t want to take revenge or commit any violence,” Sam Ath said after Wednesday’s hearing. Puthisak said the court had so far produced no evidence of their guilt. “I requested the court to not charge me because I am a victim and I requested the court to provide justice to me,” he said. 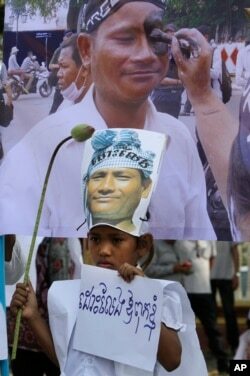 A nine-year-old daughter of detained Chan Puthisak holds a banner reading "Free my father" as she joins villagers during a protest rally in front of Ministry of Justice in Phnom Penh, Cambodia, Monday, Feb. 10, 2014. “The investigation of Sam Ath and Puthisak by the Cambodian authorities is a typically absurd and undisguised case of judicial harassment,” said Champa Patel, Southeast Asia and Pacific director at Amnesty International. A video of the incident posted on Facebook appears to show Sam Ath at the receiving end of a barrage of blows from the security forces. Licadho said in a statement that Puthisak was attacked by the guards and they turned on Sam Ath when he tried to intervene to “deescalate” the situation.